I decided a while ago to take up Lisa on her Junk Box Challenge. I was having a bit of "artists' block" and could not summon much creativity for some reason. As a photographer, my junk box consists of a box of photos I have deemed not nice enough to use but not bad enough to throw away. 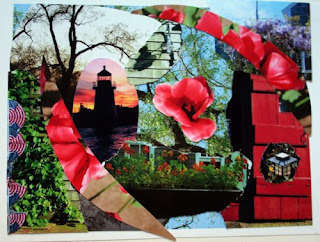 I started by taking out some of my favorites, cutting them up, arranging them by color and piecing them together on top of one plain background. 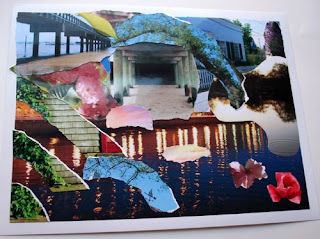 I do not do much collaging these days and the overall experience was reenergizing; I wound up with some things I thought were somewhat interesting and it really did help get the creative juices flowing again. Thanks for the idea, Lisa! What a great idea - I love the bold colors - great job!